One week from Thursday, Americans across the United States will be sitting down at their dinner table. They’ll gobble down turkey and pumpkin pie, and celebrate Thanksgiving. For most who live in other parts of the world, this day is of little consequence. However, if you are an online retailer focusing on the American market you should be paying very close attention. Thanksgiving serves as the starter gun for the holiday shopping season in the U.S., with millions of people taking advantage of the customary day off on Friday to get a head start on shopping for Christmas presents. With the growth of the online retail industry, the high sale volumes of ‘Black Friday’ have found their way on to the internet. ‘Black Friday’ sales are widely offered on e-commerce websites. Furthermore, since the mid-2000s, the Monday following Black Friday, has been established as the day for online Christmas shopping, dubbed ‘Cyber Monday’. As an online retailer selling to the U.S. (and to large extent, if you are selling to anywhere in the world, more on that in a bit), you should already have a big red circle on your calendar marking December 2, 2013 – this year’s Cyber Monday. In 2012, according to comScore, online sales in the U.S. alone totaled 1.465 billion dollars. 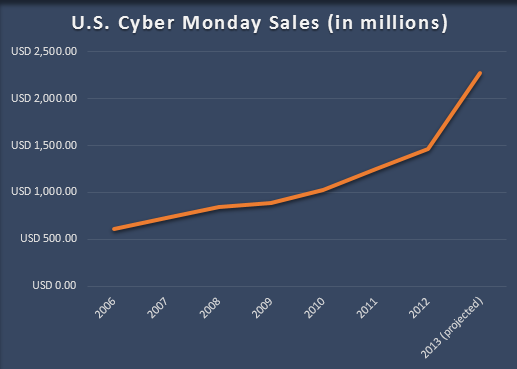 Adobe, which provides cloud based marketing services for some of the U.S. top retailers, is predicting that in 2013 U.S. Cyber Monday sales will top 2 billion dollars (!). It is worth repeating that these are the numbers for one day, in the U.S. only. The rest of the world, though, is also catching up. In Canada, Australia, Great Britain and even China, to name a few, Cyber Monday is picking up steam. Overall, FiftyOne, which specializes in international payment processing and logistics for online retailers, registered a 126% increase in Cyber Monday sales taken in by U.S. retailers from international customers, when comparing Cyber Monday 2011 to Cyber Monday 2012. You can certainly expect that trend to continue. Israelis too are joining in the fun. FiftyOne notes Israel as one of the leading countries when it comes to increased Cyber Monday shopping. In 2012 Israelis bought 603% more during Black Friday and Cyber Monday than they did on other shopping days (from U.S. retailers). This figure is particularly interesting, as most Israelis are likely not shopping for Christmas gifts, rather taking advantage of the sales and deals offered abroad for their own needs (personal purchases, for example). It’s easy to connect the dots: Israelis are attracted to big discounts and are well aware of the opportunities this time of year presents. They are on the lookout for bargains serving them well. This opens up a variety of seasonal opportunities for Israeli online vendors selling to the Israeli market, as well as to Israeli vendors selling to the U.S. For the latter, the holiday season has proven big in the past. Last year one of our customers in the fashion industry saw online sales quadruple in December, another’s grew x5. For this particular jewelry vendor, the holiday season netted 30% of its annual online sales, with more transactions taking place on Cyber Monday than on any other day of the year. Your first order of business would be to decide on your main Cyber Monday deal or sale. Think BIG; no discount is too large when it comes to Cyber Monday. Offer ‘buy one get one free’, give high percentage discounts on all or certain products, or come up with your own especially creative offers. It is important to constantly keep in mind the volume of competition your business will be in. As far as marketing, every internet asset that your business owns or manages, should be in full ‘Cyber Monday’ mode. This means your website, social network accounts and mailing lists of past customers. You should be spreading your message in every method available. In addition to spreading the message, you should also be stating it in a very clear form. Potential customers will be bombarded with marketing material from your competitors (emails, social posts, etc. ), so keep yours short, sweet, and crystal clear; present the offer and be bold with the pitch. Potential customers’ attention span is short during these times of year – drag the message on and they won’t bother, moving on to the next offer from the next brand. The holiday shopping period, and Cyber Monday in particular, present great opportunities for online businesses. Make sure your business fully takes advantage by using simple principles and putting all of your energies into it.